The communications IC market is forecast to exceed the computer IC market for the first time ever in 2013, according to IC Insights. This information is contained in the recently released Update to IC Insights’ IC Market Drivers 2013—A Study of Emerging and Major End-Use Applications Fueling Demand for Integrated Circuits. According to the research firm, this shift is due to surging smartphone shipments coupled with sluggish notebook computer sales. The total communications IC market is expected to reach US$99.4 billion in 2013, US$1.4 billion higher than the US$98.0 billion level expected for the computer IC market. 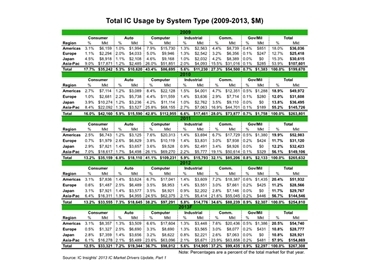 The gap between the IC markets is due to grow, as the communications IC market is forecast to register a strong 2009-2013 compounded annual growth rate (CAGR) of 16 percent as compared to only a 3 percent CAGR for the computer IC market over this same timeframe. The total communications IC market is composed of ICs sold to manufacturers of both “wireless” and “wired” electronic systems. In 2012, the total wireless communications IC market increased 3 percent, against the overall 4 percent decline of the total IC market. The wired communications IC market exhibited strong growth, outgrowing the wireless communications IC market by three percent in 2012. However, it is still a small market, being only around a quarter of the size of the US$70.1 billion 2012 wireless communications IC market. While the total DRAM market declined by 11 percent in 2012 due to desktop and laptop performance, the wireless communications DRAM market increased by 14 percent last year. Driven by strong sales of smartphones, cellphone DRAM bit usage significantly jumped in 2012. Moreover, with DRAM ASPs firming, the wireless DRAM market is forecast to surge 25 percent this year. However, the heavy usage of flash memory in smart phones means the wireless communications flash market (mostly NAND flash) is expected to rebound with a 20 percent increase after registering only one percent growth in 2012. Besides the small wireless SRAM market, the fastest growing wireless communications IC market in 2012 was the MPU segment, which includes cellphone application processors. With strong growth in the smartphone portion of the cellphone market, booming sales of stand-alone application processors from companies such as Qualcomm and Broadcom are expected to drive the wireless MPU communications IC market to US$16.8 billion in 2013, more than triple its size in 2009.